Colin Firth won Leading Actor. 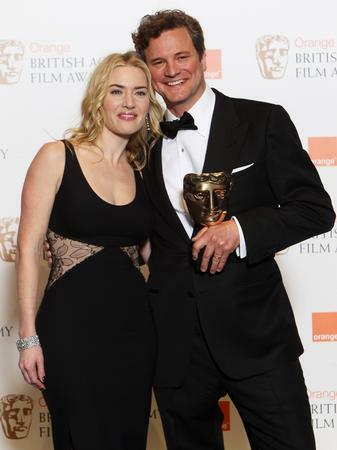 Kate Winslet presented him with the Award. 24-year-old Carey Mulligan won Leading Actress for her role in An Education. Prince William, who has been appointed Academy President, attended the ceremony. Vanessa Redgrave was presented with a British Academy Fellowship Award by Prince William. Carey Mulligan arrives at the BAFTAs dinner clutching her Award. Colin Firth poses with Duncan Jones following Jones' win of the award for Outstanding Debut by a British Writer, Director or Producer for his film Moon. Michael Giacchino, who won the Music Award for his score for Up. Colin Firth and his wife Livia Giuggioli beam at his success.